has to offer those who visit. as well as across pudding hill lane. 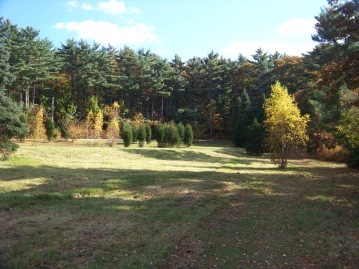 After this meadow you will find the beautiful Chandler Pond. 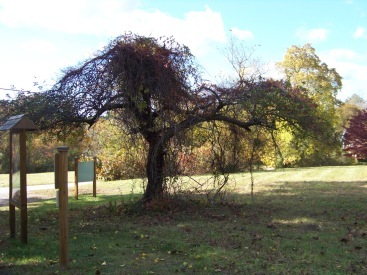 This property is owned by the Wildlands Trust. to support a milling operation. 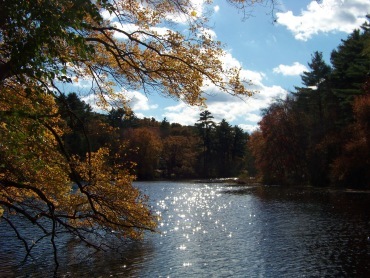 It is also called Chandler's Mill Pond and is 12 acres in size. turned to a cotton and wool manufacturing company. From exit 12 on route 3, follow route 139 east into Marshfield. After the intersection with Furnace Street approximately 3/4 mile take a right on Cross st. Follow across intersection with Old Ocean st. to near the end and Pudding Hill Lane on the left. Shortly up this lane you will find the parking lot on the left. 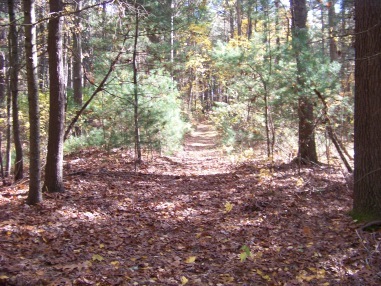 Hiking the trails here at Pudding Hill will not take much of your time but well worth the visit. 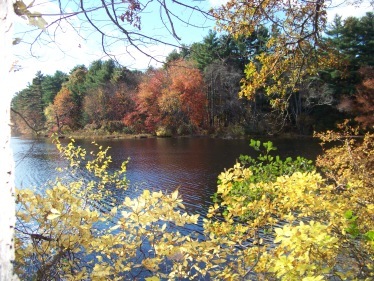 I visited in the early fall, always a good choice in New England. Not to hot and always beautiful! 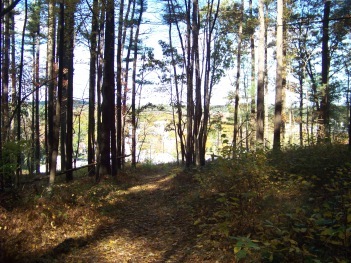 The first part of the hiking trail is a short climb. at the junction of route 139 & route 3A. 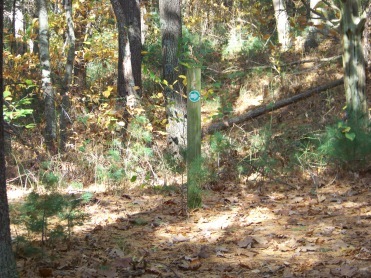 Going to the right at this main trail you will find another trail leading to the left. to a ridge above a shopping area with views to the east. 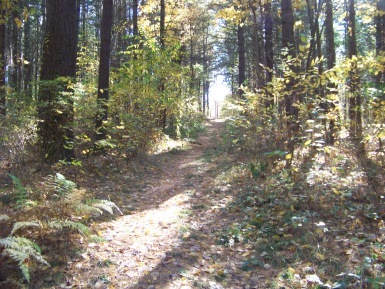 the main trail near the water tower. 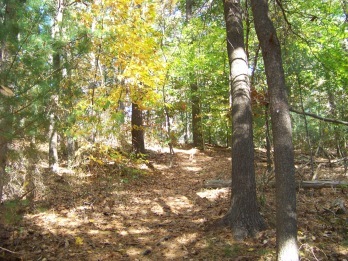 There are just short of 34 acres to this property. 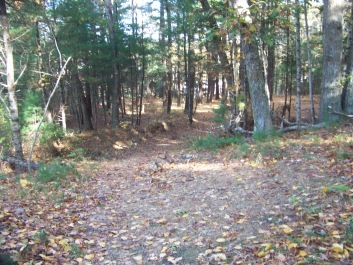 The trails cover what seems to be only part of the property. 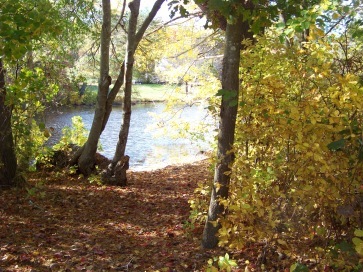 The pond was what I left for the end of my exploration of this property that day. 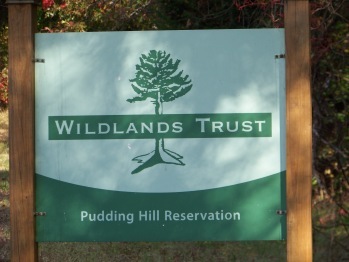 On the wildlands trust site it states that there is no swimming or boat launching at Pudding Hill yet on the sign at the property it states there is swimming in designated areas (none seem to be designated). 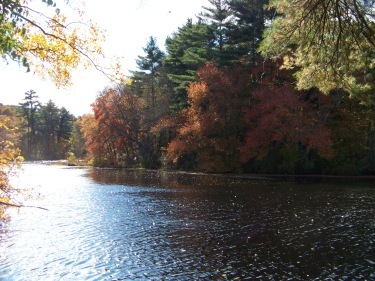 Online fishing sites say this is a great pond for large mouth bass fishing along with several other types of fish. It also says that canoes have been seen on the pond. 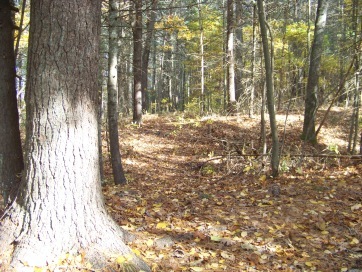 The quietness of this area makes me think that it would be a great place to observe wildlife. Most certainly birds in the spring. On the day of my exploration I knew that I disturbed some deer but was not able to actually get a sighting. (That only happens, of course, when I don't have my camera). from Boston take route 93 south and route 3 at split. Take exit 12 route 139 east. Follow through 2 intersections with lights. Take the 4th right onto Cross St. Straight thru intersection with Old Ocean St. Left on Pudding Hill Lane. Reservation is on the left. Well marked parking lot with space for 4-6 vehicles. initial climb up hill is moderate. All else is easy. swimming or boating are not permitted.